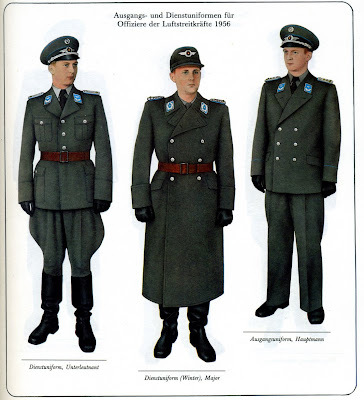 The uniform displayed here is the Gesselschaftuniform (Mess Dress Uniform) for a Major of the Luftstreitkräfte/Luftverteidigung (Air Force/Air Defense Force). The blue piping signifies the wearer's service in the Air Force with the respective officer shoulderboards and standard Air Force officer collar insignia. Again, the Gesellschaft jacket was worn specifically for formal or social occasions. The visor cap shown here for a Luftstreitkräfte officer. 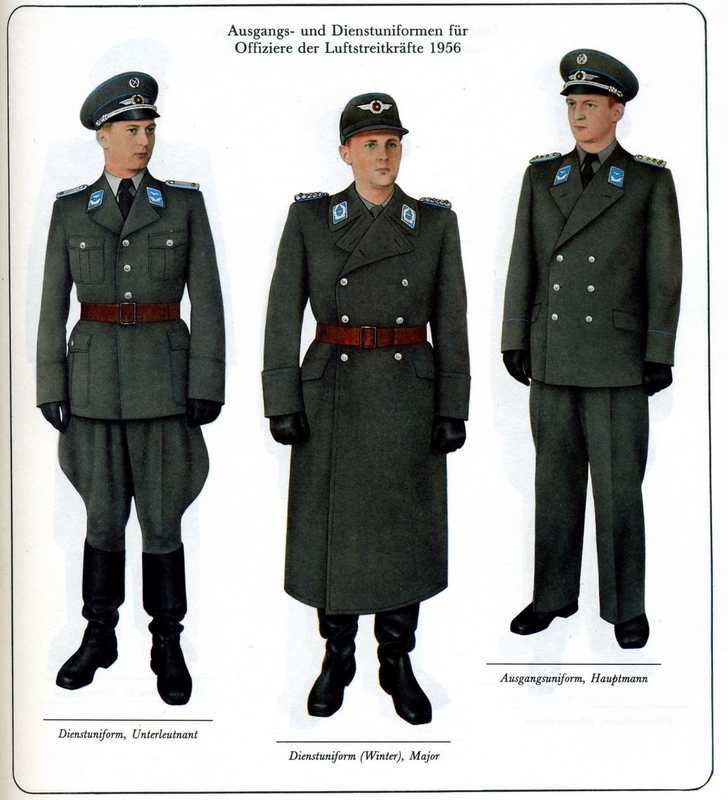 It is the dark gray color of all National Volksarmee issued hats with blue piping of the Air Service. It retains the East German national hammer and compass roundel in the center surrounded by a metal wreath and wing insignia unique to aviation forces along with the officer's silver braiding cap cord around the base above the visor. The interior of the hat is marked with the 'NVA' stamp signifying it's issue to the Ministry of Defense. The letter code shown in this example shown carries an 'L' meaning the visor was manufactured in 1987. The number beneath the NVA stamp represents the size of the hat in centimeters, this example is 57cm or roughly 7 1/8"in by American sizing equivalents. Like on the service tunic, the Gesselschaft tunic retains the Kragenspiegeln (Collar Insignia) of the LSK/LV officer corps. A single pair of silver wings surrounded by a wreath against a blue background significant of the Air Force/Air Defense Forces. It also retains the blue piping of the LSK/LV. Here is a close up of the shoulderboard insignia of a Major of the Air Force with the silver braiding against the Air Force blue background with a single gold pip. 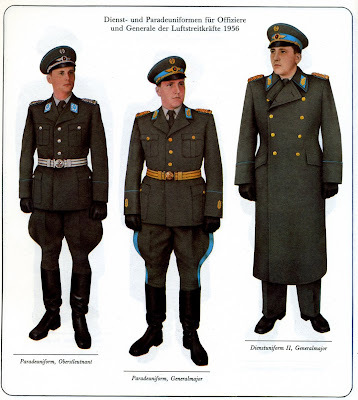 Central to East German military effectiveness was its physical fitness programs. The Deutscher Turn- und Sportbund or DTSB (German Gymnastics and Sports Association) was the essential body of the East German communist party that handled physical training for the armed forces. This organization also supplied athletes for the Olympics from the ranks of the military. Displayed here is a flappole topper of the DTSB association. It shows a black and silver wreath with the letters DTSB inscribed into them. The red signifies the communist party. Shown here is the flag essentially an honor banner of the Army & Air Force/Air Defense Forces sports organization. On the face of the flag is the logo of the physical training organization. It reads in gold lettering 'Armeesportvereinigung Vorwärts' (Army Sports Association Forward) along with the logo of the association. On the reverse is displayed it's use by the Air Force. It's essentially a red flag with gold fringe, the red signifying the Communist spirit and upon it in gold is written Sportsorganisation Der Luftstreitkräfte/Luftverteidigung (Sports Organization of the Air Force / Air Defense Force) with gold bars framing the words embroidered onto the red background. Displayed here are three Urkunden essentially certificates in these examples Honor Award Documents for the Luftstreitkräfte/Luftverteidigung. Each document was signed by General Brünner the commander of the organization. Represented here are the award documents for 1986, 1987 and 1988 respectively. It is signed by General Brünner and was presented in East Berlin in March of 1986. It is signed by General Brünner and was presented in East Berlin in July of 1987. 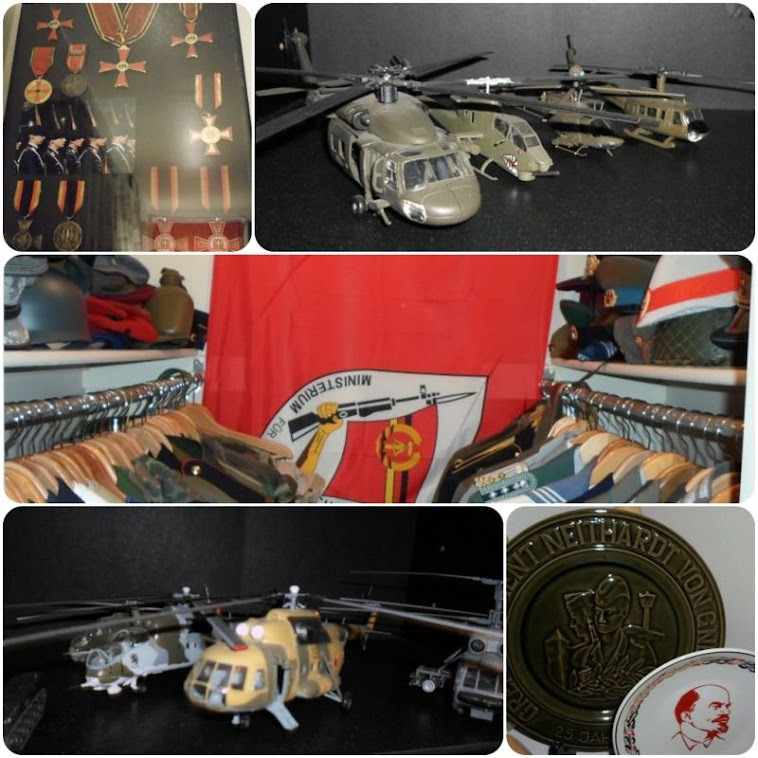 The highest level of the Army Sports Association Forwards for the excellent service through the development and strengthening of the Army Sports Association Forwards during the Sport Stafette 40 of East Germany.